Anchiornis huxleyi, artist’s impression, including the claimed feathers. Headlines are again buzzing with new “proof” of the dino-to-bird story, again from China, and again an alleged four-winged phase. The new creature is Anchiornis huxleyi, named after “Darwin’s Bulldog” T.H. Huxley, and seems to be a type of carnivorous dinosaur called a troodontid. These dinosaurs, including Troodon (pronounced TRO-o-don, from Greek for “wounding tooth”), were usually smaller than adult humans, and had very long legs, large brain, large eyes and binocular vision. Anchiornis is tiny even by those standards, estimated at 34 cm (13 in) long and weighing only 110 g (3.9 oz). It also had very long forelimbs, 80% as long as the hind limbs. One of the most exciting features, for its discoverers, is its evolutionary “age”—it hails from the Tiaojishan formation of Jianchang county, recently “dated” to between 161 and 151 Ma (million years old). Because this could be “older” than the extinct undoubted bird Archaeopteryx (153 Ma), this is supposed to solve the “temporal paradox” of all the claimed “feathered dinos” being younger than the birds they supposedly evolved into.1 In fact, this “paradox” was even worse, because the usual “feathered dino” candidates were about 10 Ma after the beaked bird Confuciusornis (135 Ma). 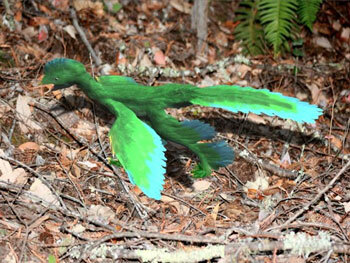 This is not the first alleged four-winged dinosaur that made headlines—in early 2003, Microraptor gui was the star. Most of the objections made in New four-winged feathered dinosaur? apply to the new star. Archaeoraptor is just the tip of the iceberg. There are scores of fake fossils out there, and they have cast a dark shadow over the whole field. When you go to these fossil shows, it’s difficult to tell which ones are faked and which ones are not. I have heard that there is a fake-fossil factory in northeastern China, in Liaoning Province, near the deposits where many of these recent alleged feathered dinosaurs were found. Anchiornis is an interesting case, because different types of feather were reported, and they seemingly covered almost the entire body. This even includes the feet, unlike modern birds. Two types of plumulaceous (downy) feather covered almost the entire head and neck, torso, upper legs, and the first half of the tail. There were also pennaceous (contour) feathers covering both limbs, and even the feet and toes. But these were symmetric, as opposed to the asymmetric flight feathers of flying birds, including Archaeopteryx. What has this to do with flight? The dino-to-bird theory is usually connected to the cursorial theory about bird evolution, where flying birds evolved from running creatures. Supposedly flight evolved from flapping their forelimbs for various proposed reasons. Evolutionary critics of the dino-to-bird idea, including Feduccia, tend to promote the rival (and older) arboreal theory, where birds evolved from gliding creatures. Anchiornis is a strange beast, and doesn’t really fit either theory. Its long hindlegs would be good for a fast runner, but feathers on its feet and toes would get in the way. 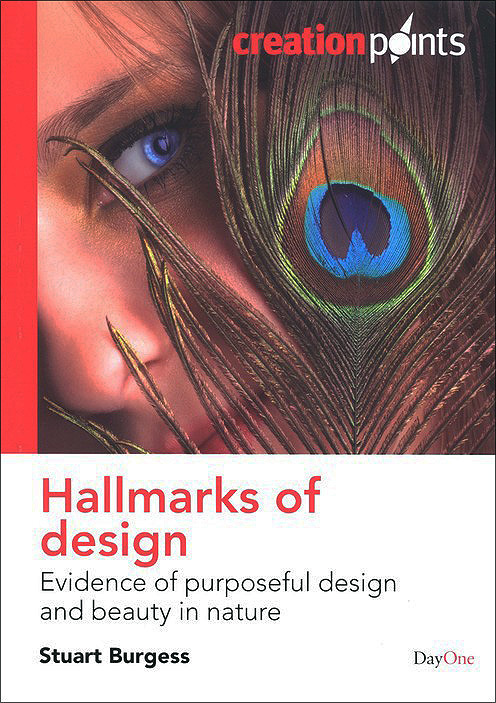 So this would be strong evidence against the cursorial theory. So evolutionary propagandists who support this theory ought not to invoke Anchiornis as support for the dino-to-bird idea. The problem for evolution is much greater than such handwaving would indicate. The imagined transition from parachuting (where the “wings” merely offer resistance to downwards movement through the air) to true gliding represents a major evolutionary hurdle in itself. But an even greater obstacle is the supposed development of the musculature and skeletal frame required for powered flight. The main point of the wings in flapping flight is not to act as a moving parachute by directing air downwards and forcing the bird upwards by reaction. Rather, as shown, the flapping wings mainly direct air backwards to force the bird forward by reaction, so the airflow over the airfoil-shaped wings generates lift. Therefore flapping flight also requires highly controlled muscle movements to achieve flight, which in turn requires that the brain has the program for these movements. Ultimately, this requires new genetic information that a non-flying creature lacks. This new discovery also fails to solve the problem of the different breathing system of reptiles and birds. In particular, a highly movable hindlimb could not have supported the air sacs that are an essential support for the one-way flow of air through the lungs.7 See Bird breathing anatomy breaks dino-to-bird dogma. But they have merely replaced one temporal paradox with another: … according to their own calibrated phylogeny, Anchiornis is about 30 Ma older than the next youngest, and more ‘dino-like’, troodontid. That is, according to their own calibrated phylogeny,8 Anchiornis is about 30 Ma older than the next youngest, and more “dino-like”, troodontid. This means they must postulate a much earlier evolutionary history than actually demonstrated in the fossil record. Hu, D.; Hou, L.; Zhang, L. & Xu, X., A pre-Archaeopteryx troodontid theropod from China with long feathers on the metatarsus, Nature 461 (7264): 640–643, 24 September 2009. Return to text. Barras, C., Feathered dinosaur older than earliest bird, New Scientist online, 25 September 2009. Return to text. Discover Dialogue: Ornithologist and Evolutionary Biologist Alan Feduccia Plucking Apart the Dino-Birds, Discover 24(2), February 2003. Emphases added. Return to text. Feduccia, A., Lingham-Soliar, T., and Hinchliffe, J.R., Do feathered dinosaurs exist? Testing the hypothesis on neontological and paleontological evidence, Journal of Morphology 266(2):125–166, 10 October 2005 (DOI: 10.1002/jmor.10382). Return to text. Lingham-Soliar, T., Alan Feduccia, A. and Wang, X., A new Chinese specimen indicates that ‘protofeathers’ in the Early Cretaceous theropod dinosaur Sinosauropteryx are degraded collagen fibres, Proceedings of the Royal Society B doi:10.1098/rspb.2007.0352. Return to text. Gee, H., Fossil boosts trees-down start for flight, Nature Science Update; 23 January 2003 | doi:10.1038/news030120-7. Return to text. Quick, D.E. and Ruben, J.A., Cardio-pulmonary anatomy in theropod dinosaurs: Implications from extant archosaurs, Journal of Morphology, 20 May 2009 | DOI:10.1002/jmor.10752. Return to text. Ref. 1, fig.4. Return to text.